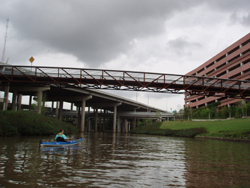 Download PDF version of map of Buffalo Bayou Paddling Trail (PDF 209.6 KB) which includes GPS coordinates and estimated float times for each segment. Depending upon water levels and flow rates the paddling time can vary. Due to the length of the trail, it is too long to paddle in one day. Individual segments of the trail can be paddled in 1.5 to 4 hours of paddling. Please note: The water quality of the bayou is variable, but is generally unsuitable for swimming. Precautions such as washing hands and using hand sanitizer are recommended. 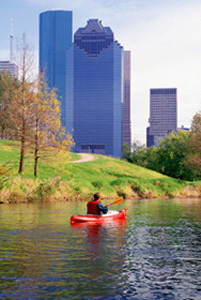 The 26-mile paddling trail begins at Highway 6, and then ducks into Memorial Mews Park in Langham/South Mayde Creek for approximately 200 feet. After returning to Buffalo Bayou, the trail then follows the bayou downstream to the takeout at Allen’s Landing. The banks of Buffalo Bayou expose a beautiful geology of sand, sandstone and red Beaumont clay. While some sections of the bayou are straight-cut with low embankments, other sections are serpentine with high cliffs. Because the bayou offers little elevation change there are few riffles along the trail. Buffalo Bayou is a semi-natural stream with flow and water quality conditions that are influenced by water releases from Addicks and Barker Reservoirs, storm water runoff, sewage treatment plants, and natural springs. Trips should not be attempted in high and turbulent water conditions. Log jams, known as “strainers”, can be very hazardous and should be avoided; portage around them. The bayou supports numerous sunfish, bass and catfish. Small lures such as jigs, plastic worms, spinner baits and lite-line are recommended. A fish consumption advisory was established for Buffalo Bayou and to determine the most current status, please contact the Department of State Health Services for more information at 512-834-6757 or see the web site, www.dshs.state.tx.us/seafood/, before eating fish caught on the bayou. Buffalo Bayou has a great diversity of flora and fauna along its banks. Egrets, herons, hawks, and other birdlife are commonly seen. Rabbits, turtles, fishes, snakes, and even an occasional alligator might also be found along the bayou and the tributaries. The bayou has huge numbers of trees such as black willow, box elder, cottonwood, loblolly pine, and sycamore. It also has less common trees, like oaks and hickories and a surprising amount of understory. Like most urban streams, Buffalo Bayou has problems with invasive exotic plants and animals. Discovery Green is a 12-acre park in downtown Houston near the George R. Brown Convention Center where visitors can enjoy natural, recreational, art, dining and eco-friendly features, including a one-acre lake, a children’s playground, an amphitheater, dog runs, public art works, restaurants, an interactive water zone and more. Open daily from 6 a.m. – 11 p.m. The Houston Museum of Natural Science, founded in 1909, is one of the most visited museums in the country. Located inside Hermann Park, adjacent to the Sam Houston Monument, the museum is a five-venue complex. It houses the Challenger Center, the Wortham IMAX Theater, the Burke Baker Planetarium and the Cockrell Butterfly Exhibit. An additional four floors of natural science halls and exhibition space allow the museum to serve its mission to "Preserve and advance the general knowledge of natural science; to enhance in individuals the knowledge of and delight in natural science and related subjects; and to maintain and promote a museum of the first class." The Houston Zoo, located inside Hermann Park, provides a fun, unique, and inspirational experience fostering appreciation, knowledge, and care for the natural world. Essentially a small city encompassing a world of ecosystems and experiences, the Zoo provides housing, meals, medical care and even education for more than 4,500 permanent residents (the animals). About 1.6 million guests visit each year to experience the incredible variety of animals and ecosystems, as well as attend special private and public events and entertainment. The Houston Zoo was recently named one of the top 10 zoos in the country by Parents magazine. Founded in the 1900s, Texas' first municipal art museum houses a vast permanent collection of more than 27,000 pieces. Highlights include the Beck Collection of Impressionist and Post-Impressionist Art, featuring creations by Vincent Van Gogh, Claude Monet, Henri Matisse and Paul Gaugin. The Lillie and Hugh Roy Cullen Sculpture Garden is in a landscaped setting created by Isamu Noguchi for the museum's 19th- and 20th-century sculptures. The garden includes pieces by Auguste Rodin, Matisse, Alberto Giacometti and Frank Stella. The Glassell School of Art, established in 1927 as the teaching wing of the museum, presents exhibitions by its students and the best of today's Texas artists. The Audrey Jones Beck Building was designed by acclaimed Spanish architect Rafael Moneo and completed a 15-year period of growth for the museum. Located on the western edge of Memorial Park, the Houston Arboretum & Nature Center offers an escape from the hustle and bustle of city life and the opportunity to experience the natural world. This 155-acre non-profit urban nature sanctuary provides education about the natural environment to Houstonians of all ages. It plays a vital role in protecting native plants and animals in the heart of the city where development threatens their survival. Visitors can explore nature by walking on trails (totaling 5 miles) free of charge. Each summer, children gain in-depth knowledge leading to life-long appreciation of the natural world through week-long Discovery Classes. Thousands of school children visit the Arboretum on field trips designed for their age and grade level. The Nature Center building includes the Discovery Room with interactive exhibits and activities and the Nature Shop filled with items for nature lovers of all ages. This trail has been made possible through a partnership between Texas Parks and Wildlife Department, Bayou Preservation Association, Harris County Precinct 3, Houston Parks and Recreation Department, United States Army Corps of Engineers, Harris County Flood Control District, Buffalo Bayou Partnership and Houston Canoe Club.